Seaside Heights firefighters brought a small – but potentially dangerous – electrical fire in an arcade machine under control quickly Monday night. Sources tell Shorebeat that the fire, first reported by a contributor to the Jersey Shore Hurricane News social media page, was electrical in nature and set a piece of arcade equipment fire at the Hershey’s Shake Shoppe Arcade, located on the boardwalk near Hancock Avenue. 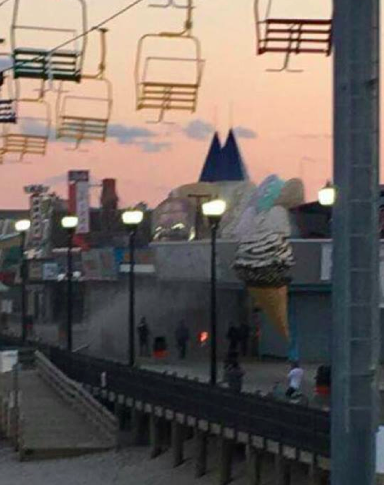 According to a statement from borough police, an officer responded to the arcade and found the machine on fire and an employee pushing it outdoors to the boardwalk. A firefighter then doused the fire with an extinguisher, putting it out. The southern end of the borough’s boardwalk is still recovering from a fire in Sept. 2013 that destroyed several blocks of buildings along the beachfront.